Creative Connections Expo 2011 presents a convenient one-stop resource showcasing the latest innovative ideas to expand business visibility. The local event will explore products and services available offering creative marketing strategies from Colorado’s leading creative service advisors. It will help educate businesses on the latest innovative ideas to energize their marketing strategies from Websites and video to strategies and writing. Key areas of focus for the event are marketing, Internet presence, social media, website, multi-media, and publications. 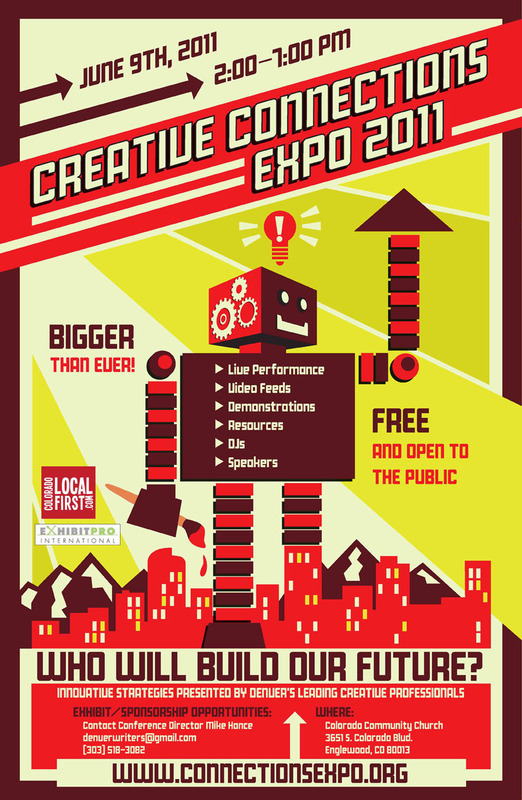 Creative Connections Expo 2011 will feature a series of educational seminars in addition to the booths that will present the latest information on how to effectively use creative services to increase business profits. Attendees will include marketing professionals, CEOs, business owners, entrepreneurs, and business managers responsible for promoting their businesses and hiring creative’s to promote their business as well as creative’s seeking the latest innovative practices. Ideas and strategies to integrate creative services to grow company profitability will be demonstrated. The Creative Connections Expo 2011 will be held Thursday, June 9th from 2:00 p.m. to 7:00 p.m. at Colorado Community Church – 3651 S. Colorado Blvd, Englewood, CO 80113. This event is FREE and open to the public. For more details, click here.